The Wrangler is an unmatched off-roading SUV, with incredible style and capability. The Wrangler is a two-door model, with seating for four, and it competes against the Toyota 4Runner and Nissan Xterra. New for 2015 is an eight-speaker stereo, which is standard, while there is also an optional updated Alpine premium stereo with a subwoofer. Now standard is a Torx toolkit, and the Sport models can have 16-inch black steel wheels with 31-inch off-road tires. There is also a Rubicon Hard Rock edition which features a black grille and the Alpine stereo. The Wrangler comes equipped with a 285 horsepower, 3.6-liter V-6 engine which is mated to a six-speed manual transmission. Also available is a five-speed automatic transmission. The Wrangler is also a four-wheel drive vehicle. The Wrangler was built for performance, and features dual locking differentials, electronically disconnecting front stabilizer bar, solid front and rear axles, towing package with trailer-sway control, and underbody skid plates. The exterior of the iconic Jeep Wrangler is truly eye-catching and unique, and the standard Torx Toolkit makes it even easier for people to customize their ride. 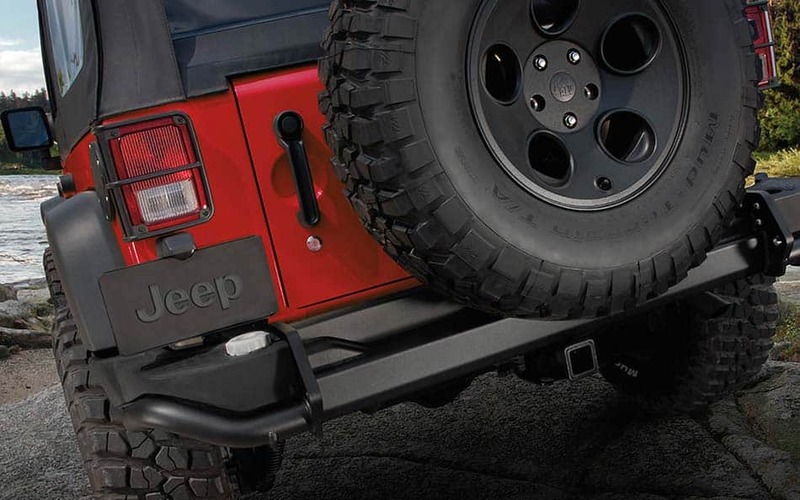 With the Torx tools, Wrangler owners can remove their side doors, the roof, and bumper end caps. The windshield can also be folded down, and there is an available hardtop with removable overhead sections. On the inside, the Wrangler can be equipped with either cloth or optional leather upholstery, heated front seats, air conditioning, and power windows and locks. On the technological front, the Wrangler packs a stereo system, yet customers can also choose to upgrade to the premium Alpine stereo system. With Jeep's Uconnect media system, drivers also have access to navigational systems. Not only is the Wrangler the ultimate performance vehicle for off-road explorations, it also has a number of safety and security features for those times when an adventure is the last thing you need. Among those features, customers will find front-seat side-impact airbags, electronic stability system, antilock brakes, front airbags, and hill start assist. Have a question about this incredible off-roading vehicle? Give us a call, or fill out the form below, because we would love to discuss the iconic Jeep Wrangler with you!